About one in five prescriptions is “off label”—that is, a drug prescribed to treat a condition for which it hasn’t been approved by the Food and Drug Administration. That’s a legal option for physicians, and it’s frequently a necessary one. Certain populations (notably children, pregnant women and the elderly) often aren’t included in trials needed for drug approval. In some cases, using nonapproved therapy is considered the standard of care; other times, trying a drug for an off-label use may be a last resort when other options have been exhausted. Yet despite the prevalence of off-label prescribing, drugmakers have long been prohibited from promoting such uses. However, a federal court recently ruled in favor of a pharmaceutical company representative who argued that such prohibitions violate the right to free speech. While some cheered the decision as a victory for the First Amendment, many worry that it could have dire implications for patients. But letting drug reps promote off-label indications could lead to trouble, says Harvard Medical School assistant professor of medicine Aaron Kesselheim, who wrote about the Caronia decision in the Journal of the American Medical Association. While acknowledging that certain nonapproved uses are beneficial, Kesselheim notes that certain other common off-label uses do more harm than good. He points to nonapproved prescribing of antipsychotics such as Abilify (aripiprazole) and Risperdal (risperidone) as an example. These drugs are approved for treating schizophrenia and bipolar disorder, but are commonly used off label in nursing homes to treat agitation and dementia in the elderly—despite a paucity of research to support such uses and the risk of serious side effects. Kesselheim fears that increased promotion of off-label uses could produce other such abuses. “Patients will be exposed to more drugs that have insufficient evidence of benefit but substantial risks,” Kesselheim says. 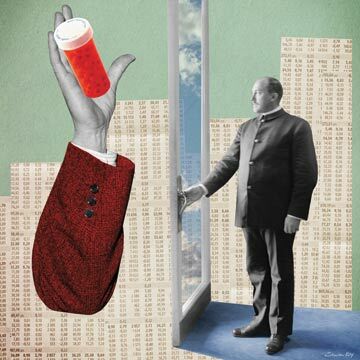 A physician may be a receptive audience when a drug rep explains a new off-label use. Other research suggests that drug reps already influence physicians’ prescribing habits, including their decisions to use drugs off label. University of California, Davis ethicist Ben A. Rich compares the relationship between doctors and drug reps to that of legislators and lobbyists. Like a legislator, a physician may be overwhelmed with information every day, so he or she may be a receptive audience when an expert offers to explain a complex issue, such as a new off-label use for a drug. Yet physicians still need to make the effort to determine whether what they hear from a drug rep is accurate, says Rich. One FDA official—Robert Temple, deputy center director for clinical science at the Center for Drug Evaluation and Research—told The Pink Sheet, a pharma industry newsletter, that expanded off-label promotion could undermine the agency’s ability to regulate the safety and efficacy of drugs. The FDA has stated that it will not appeal the Caronia decision but will continue to prosecute the “misbranding” of drugs.